Skincare is important to me. I have acne-prone, blemished and sensitive skin so skincare is vital to ensure my skin can be the clearest it can be without aggravating it. For the majority of my teen years I had been using The Body Shop Tea Tree range and now I have decided to try different skincare items from them. 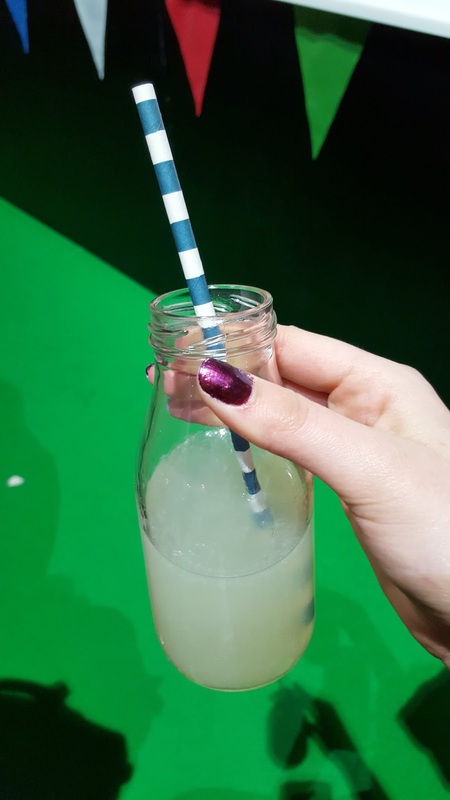 A couple of months ago, I went to The Body Shop Cribbs Causeway blogger event and as part of that I had a skincare consultation. After having a talk about my skin type, the lady suggested to me that I tried items from the aloe range. She explained to me that aloe is perfect for sensitive skin and for calming things down. The Aloe Soothing Night Cream is a cream that you use at night time (duh!) which is thicker than the day cream. The lady tried both on the back of my hand and you can definitely feel the difference between them! The product claims to moisturise, be fragrance, colour and alcohol-free with no added preservatives. It says it's best to hydrate skin that needs more gentle care. The packaging is a slim tub with a pale green lower half to represent the aloe. The product looks more than just your average budget moisturiser and instead looks more luxurious. It looks different to how it does on The Body Shop website so I believe they have had a packaging change. There is also a plastic pull-off lid on the inside which stops any product leaking out of the tub or getting on the roof of the outside lid which is handy! The cream is thick like how you'd expect from a night cream, but it is not greasy. It's true that a little bit goes a long way and it takes about 15 minutes to soak in fully. I like to keep my hair out of the way in this time as your skin will feel a bit sticky but after it has soaked in it feels fine. Even though it is thick it does not feel heavy on the skin which I am grateful for because when creams feel thick I get worried that it will clog my pores. It also seems calming and soothing on the skin. I apply it to my face, neck and even around my eyes and it doesn't sting or aggravate at all. Because of my acne I use a lot of skincare products with salicylic acid in and/or tea tree, meaning that on my sensitive skin it can dry it. Lately I have been using a lot of salicylic acid which has left dry patches, particularly on my nose and above my eyes (even though I'm not actually applying it to my eye area!) so I needed something nourishing. This night cream has been quick to get rid of my dry patches and because of it I now have no dry skin on my face! When I wake up in the morning my skin does feel much more moisturised than if I had used one of my normal moisturisers before bed. When I first started using this night cream I couldn't get over how soft my skin was that it was hard to refrain from stroking my face! Admittedly after a week of my skin getting used to the product it didn't feel as soft as it initially did, but it still does feel pretty smooth and hydrated. I do really like this product. It is £13 but because of it being my birthday this month The Body Shop gave me £5 to spend and then I had a discount on top which means I only paid £4! Despite this I would say it is worth the money and I would repurchase this. It is 50ml so it would be easy to take on holiday and I can imagine it would be amazing to use on your face after you've been out in the sun all day, especially if you've gone red! I would recommend this mainly to anyone who has sensitive skin and/or has sore, dry patches that you want to clear up. I don't know about you, but I love black. 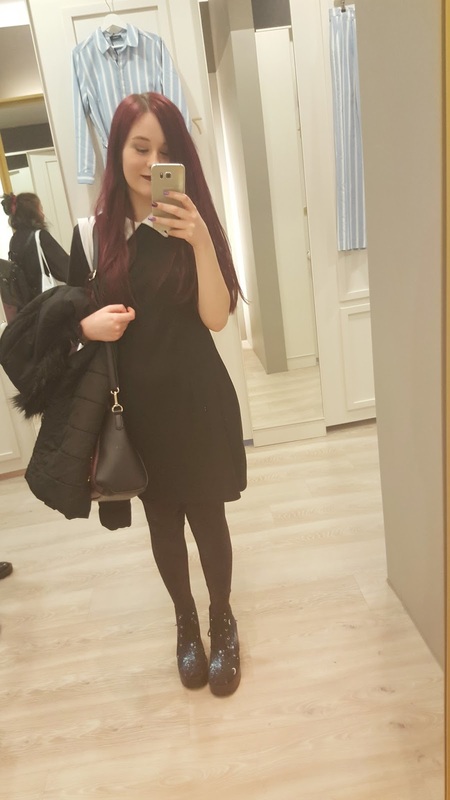 Black is my favourite colour to wear, to have in my room and just in general: I love black. So even when it gets sunny and warm, I still wear black! Don't get me wrong I love reds, purples and blues too, but nothing beats black for me. It goes with everything and I find it flattering on my figure. I've compiled a few items from Boohoo I quite like that I would love to have this year. I've been looking at Boohoo a lot the past few days as I need to start buying summer clothes for my holidays and these are my favourite pieces. The top two items are playsuits. I've never worn or tried a playsuit before so I want to try some out this year. The first one (Julia Eyelet Detail Suedette Playsuit) is strappy with corset straps across the cleavage; showing a bit of skin. It is faux suede and would great on a night. As for the day I picked Mia Cold Shoulder Crochet Trim Playsuit which is much less fitted and more loose which I think would be great for daytime in the heat. Just remember to suntan those shoulders! What is summer without denim shorts? Denim is my favourite material for shorts because they're tight and never seem to go out of fashion. I love hot pants to keep my legs cool in hot weather and the rips make it more grungy which I like. These denim shorts (Emma Extreme Frayed Low Rise Denim Hotpant) would look good with a vest top or maybe even a band top! Now I'm not saying wear all black this summer because it attracts the heat and you'll get hot, but wearing something black is a nice way to incorporate bright summer colours into your outfit because you'll always have a colour on that goes with it. 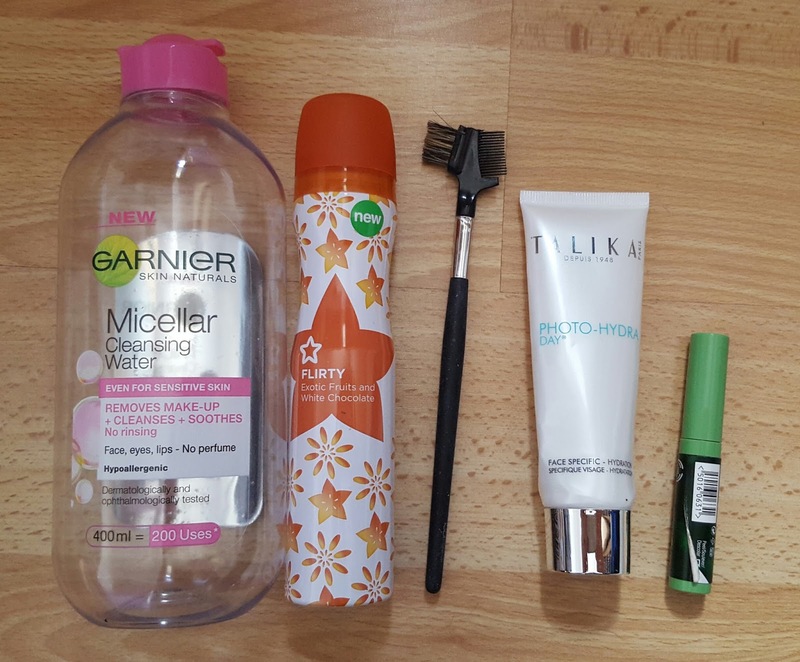 Garnier Micellar Cleansing Water- Need I really explain any more? holy grail. Superdrug Flirty Exotic Fruits & White Chocolate- This was just a cheap body spray that was simply 'meh'. It did the job for a quick fix but wasn't exactly long lasting. BD Eyebrow and Eyelash Brush- I thought I would include this because it was one of the first brushes I had ever bought and have probably had it for about 3/4 years. But now it is to be put to rest because it has snapped! I've now replaced it with a Boots one. You've served me well. The Body Shop Tea Tree Blemish Gel- I love and adore The Body Shop's tea tree range. This blemish gel doesn't last very long but it's good to use when you have an annoying spot come up you just want to get rid off! For the last 3 or 4 years I have had quite the nail polish collection. 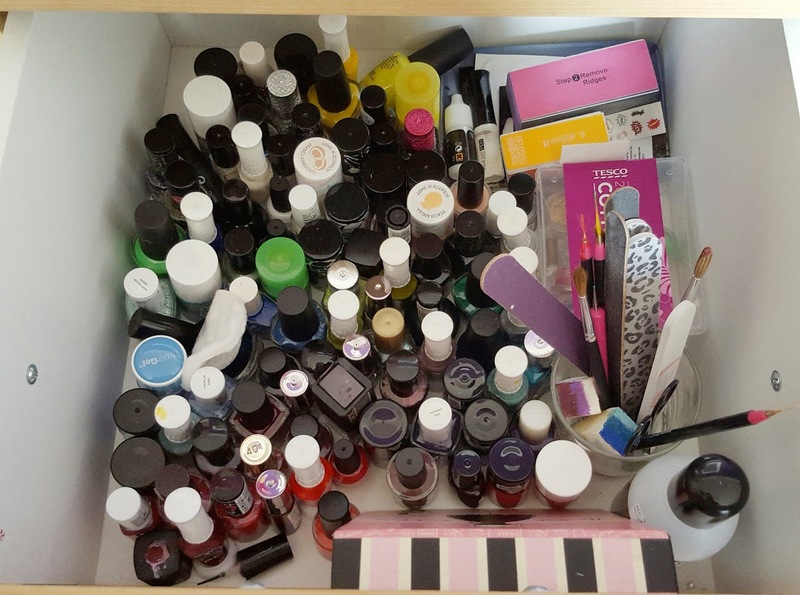 I used to be obsessed with nail polish and racked myself up about 130 nail polishes! 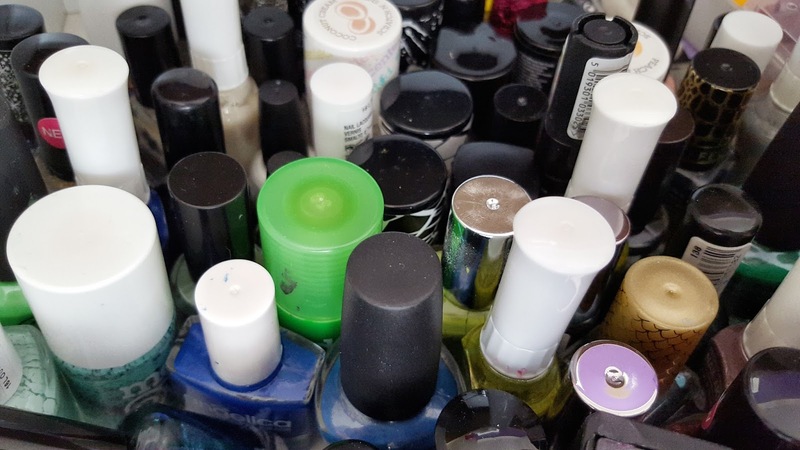 However, a couple of months ago I did a big tidy out and chucked away all nail polishes that had gone gloopy and gave away ones I knew I wouldn't use (i.e. the pink ones). I was also not happy with the way I organised them as I struggled to find anything I wanted and would forget about half the ones I had! 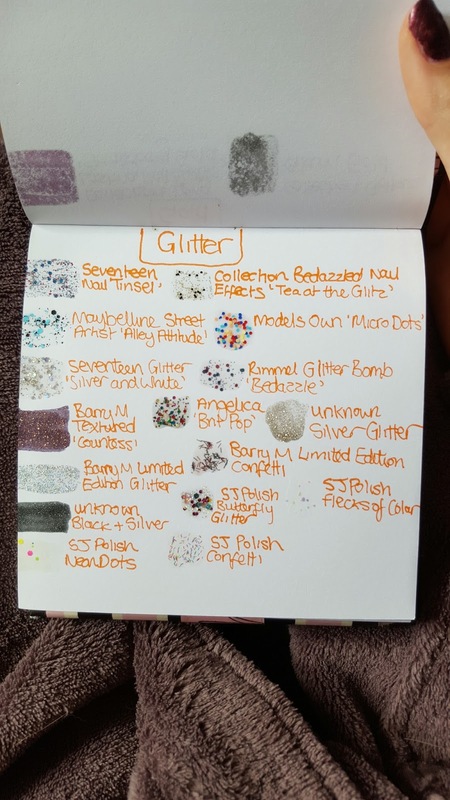 After getting rid of all the polishes I didn't want, I had the idea of making a nail polish book. My collection is too large to remember all the shades I have so to help this I grabbed an old notebook and made a page for each colour. Then, I painted a swatch of each and every colour and wrote their name next to it. I find this extremely helpful because when I want to paint my nails I have a flick through the book and decide what colours I want to use. I can see the colours and I can see the different shades which means I manage to use everything in my collection and not just the ones I remember! If you have a large collection I really recommend doing this. The other way I organised my nail polishes was by organising them into colour categories in my drawer. 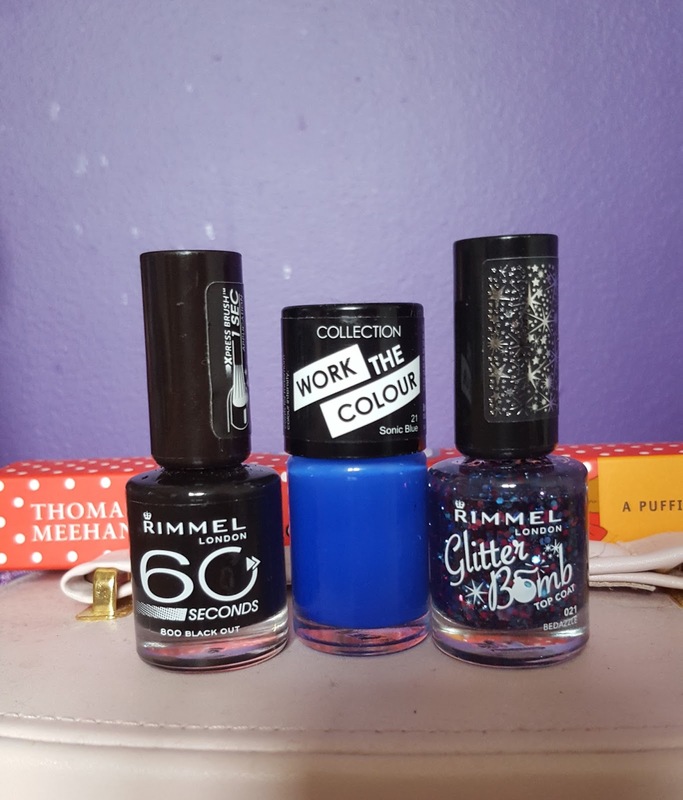 Rather than having them all mixed up I keep them in their colour groups which makes it simple to find the one I'm looking for after choosing it from my nail polish book. I know some other people keep their polishes in their brand categories but I prefer to do it by colour. 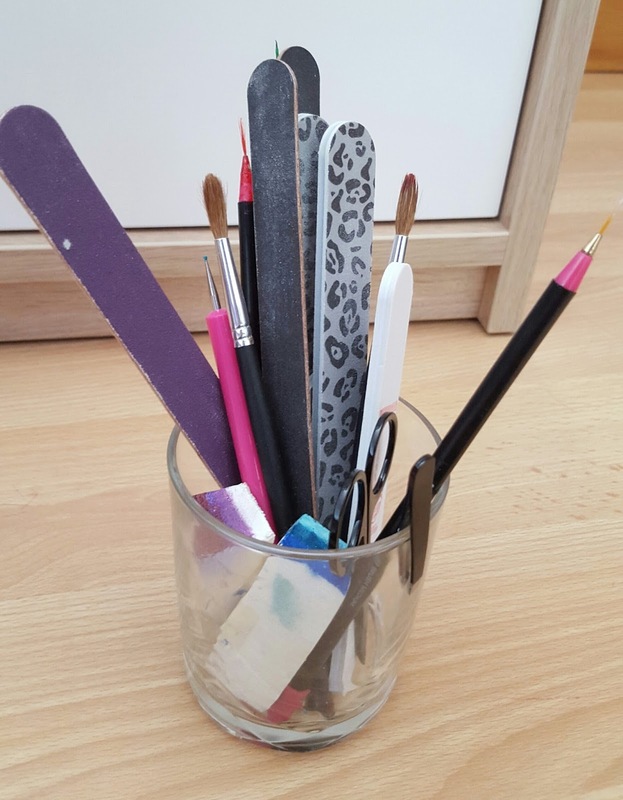 When I've chosen my polishes I will keep them out of the drawer on my bedside table ready for any touch ups and then when I'm done they go back into their groups. When I was younger I also used to be really into nail art so I have quite a few tools, glitters and stickers too. Before I organised them they were just all over my nail polish drawer and I would forget all about them so now I keep them separate and together. As you can see in the photo above I keep all my nail files, nail art brushes, dotting tools, sponges, tweezers and nail scissors together. I keep them in a jar which is actually a Nutella jar! My favourite trick for organisation is cleaning out Nutella jars when you've eaten all the yummy goodness because the jars are actually quite nice. Another thing I've done to keep certain tools together is by using a tray. This is a tray I used to use on my dressing table but now I've recycled it for my nail file blocks, nail glue, stickers and gems. 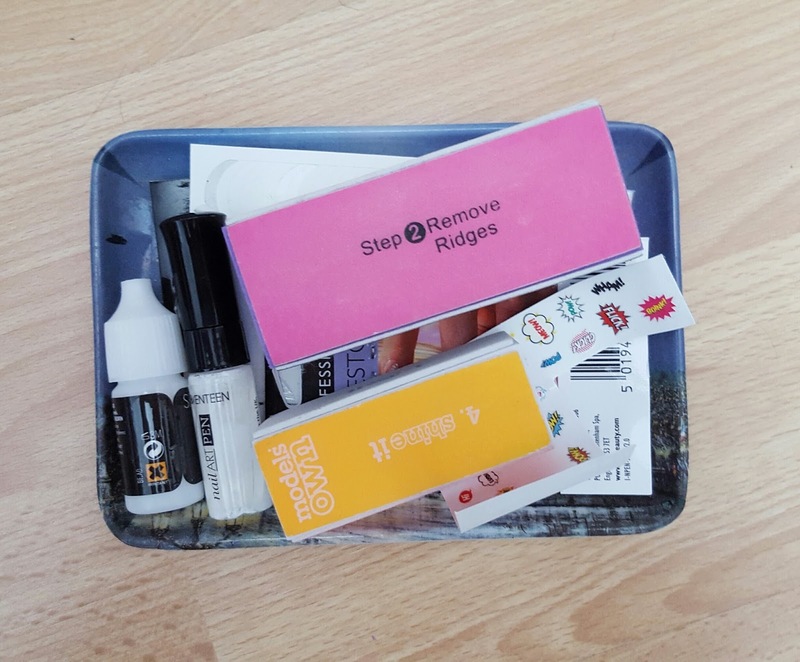 The tray ensures that the sheets of nail stickers don't end up getting lost amongst the jungle of nail polishes and all stay together instead. Last of all are my nail glitters. I don't use these much if I'm honest but I keep them anyway just in case (and come on- they are pretty!). To keep these together I have recycled a cotton buds tub and put them in there. 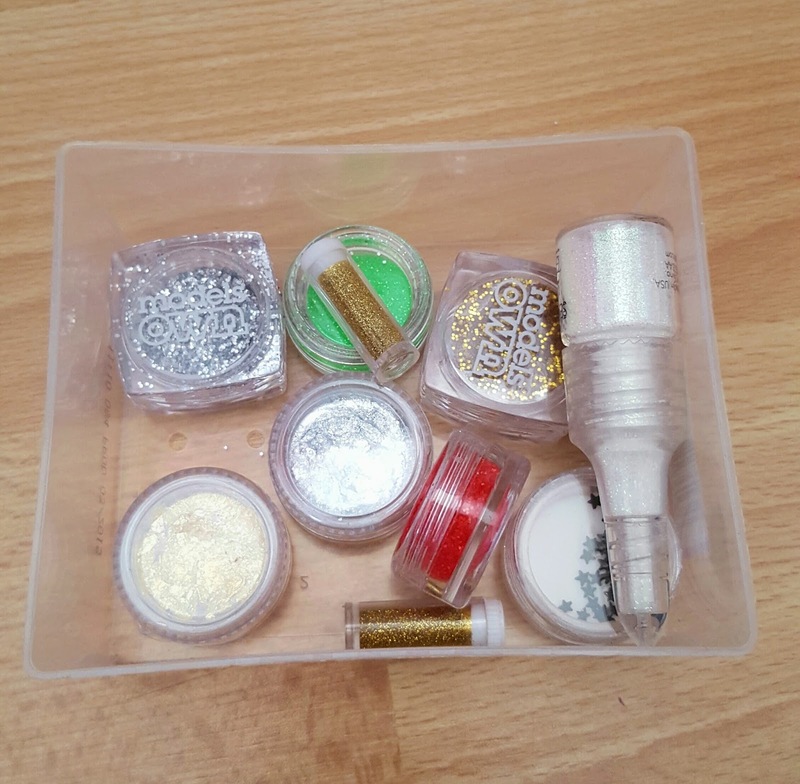 Now if I want to go for a really glittery look I can just pull out the tub and pick which colour glitter I want to go for. So that's my nail polish and tools organisation! I am well and truly happy with my collection and how it is all laid out now which is the first time I have been happy with it. I find it easy to pick and choose what I want and it how tidied it is makes it visually pleasing for me. I didn't have to buy anything to do it and just recycled things I already had. You can do this too with things you just have lying about in your house! 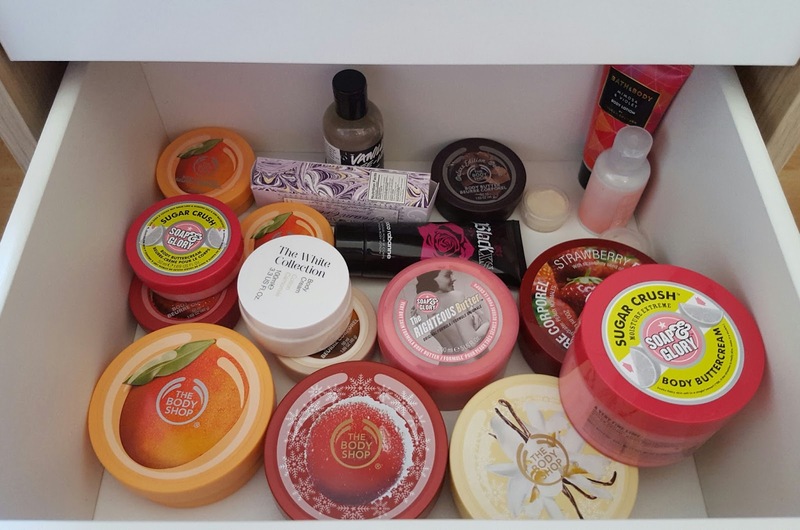 I recently moved my collection of body butters and lotions into a new set of drawers from Ikea so I thought I may as well show you guys what I've got. 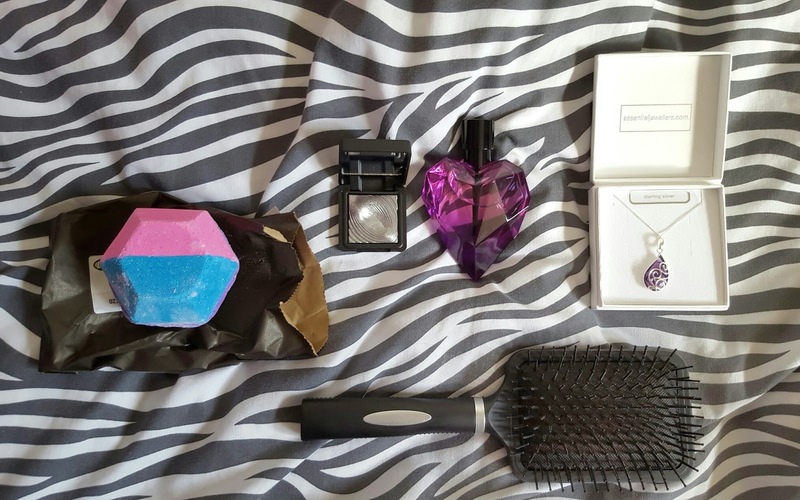 None of these I've actually bought myself as they have all come from birthdays, Christmases, events and beauty boxes. I mostly like to use these creams after shaving because I find I can get dry skin after shaving otherwise. I never used to remember to do it, which I think a lot of people find, however I've been getting really good at remembering the past few months! Soap & Glory Sugar Crush Body Buttercream x2- I LOVE the smell of these! It is sweet, citrusy and makes me think of sugar and lime. Soap & Glory The Righteous Butter- This doesn't have a strong as smell as the Sugar Crush and is more a basic subtle cream. Bath & Body Mimosa & Violet Body Lotion- I've had this for so long I can't even remember where it came from! Paco Rabanne Black XS Body Lotion- This came in a set with perfume that my friend bought me. I love the smell of the perfume so I am sure I will enjoy this. Lush Vanilla Dee-Lite Body Lotion- I've used this a bit and it is a nice, thick vanilla lotion. Plus, how punny is the name?! The White Collection Cotton Camomile Body Cream- This is what I am using at the moment out of my collection. It is a basic cream but a little goes along way and I've nearly finished it. Royal Apothic Moisturising Body Creme- I got this in a GlossyBox and you apply it on to damp skin. I used it for a bit when I first got it and found it hard to remember to do it before my skin was dry so I will have to get used to it! 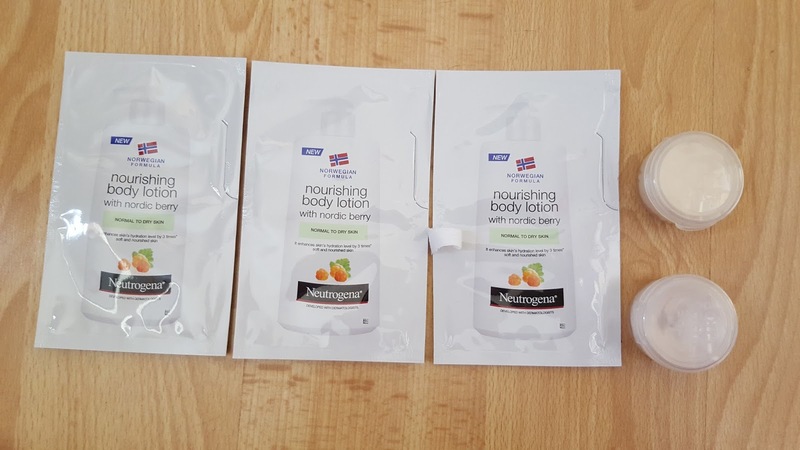 Neutrogena Nordic Berry Body Lotion Samples x3- I got these in a goody bag from Bristol Fashion Week last year. I'm saving them for travelling! The Body Shop British Rose Butter Sample- This came from a goody bag at an event The Body Shop held. It came in for Mother's Day and I had a hand massage using the products from The British Rose range. 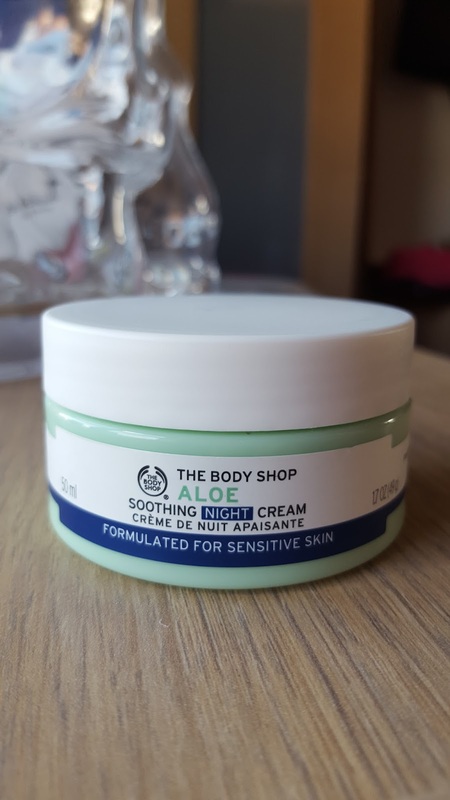 The Body Shop Kukui Cream Sample- Another sample from the Body Shop event. I haven't used this one before or even heard of it but I did my research and found it was from their Spa of the World range. That makes me quite excited to try it! The Body Shop White Musk Body Lotion- I'm not sure how I feel about musk but it is definitely a stronger scent. Doesn't mean I won't use it though! The Body Shop Cranberry Body Butter- This is a Christmas one and I love berry colours and smells so I can't resist. 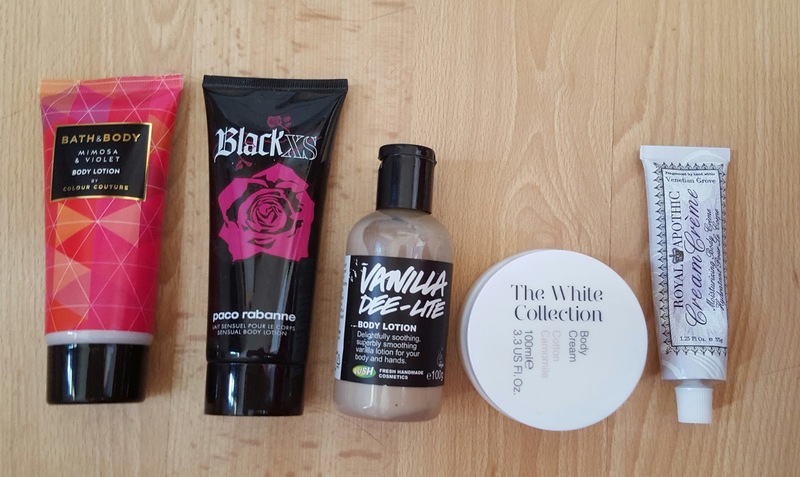 The Body Shop Vanilla Body Butter- I've used this one quite a few times in the past yet still have lots left. A strong vanilla scent for sure. 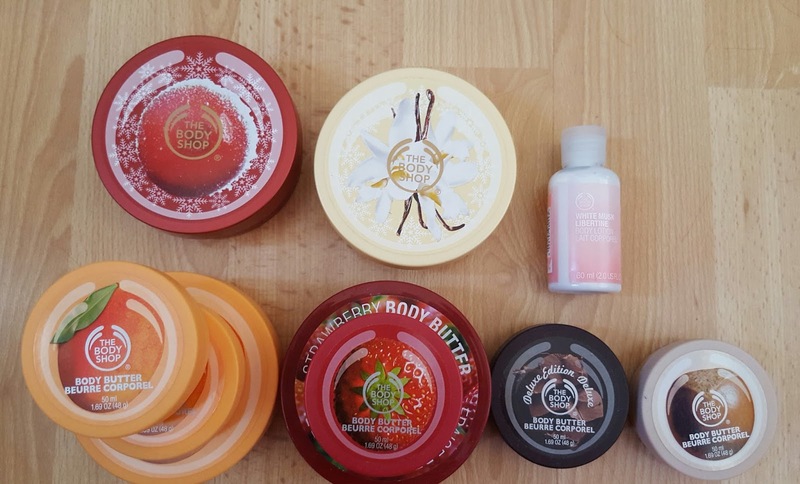 The Body Shop Mango Body Butter x3- Can you tell which one is my favourite scent?! I don't eat mangoes but there is something about the smell that I adore. I also love the body scrub of this. The Body Shop Strawberry Body Butter x2- The strawberry ones just scream summer to me so will be sure to use it in the warmer months. The Body Shop Chocomania Body Butter- I don't know if this one is for everyone as it is a very strong cocoa scent. It's not one of my favourites but I don't hate it! The Body Shop Shea Body Butter- Everyone knows shea is great for moisturising so I'm sure this one will be nice on particularly dry skin. Do you always remember to use body butters and lotions? What are your favourites? 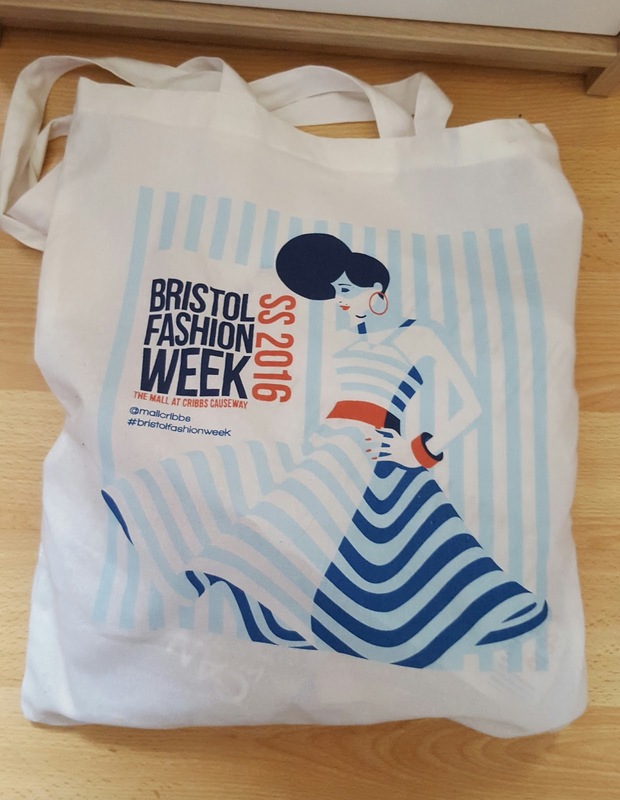 About a week ago Emily and I went to Bristol Fashion Week held at The Mall Cribbs Causeway. 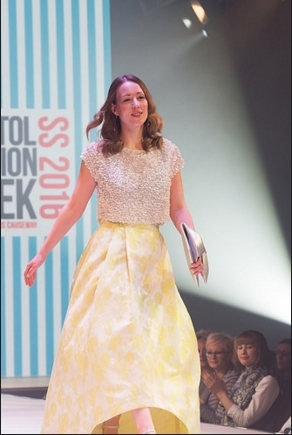 This was my second time at Bristol Fashion Week, my first time being the 2015 Autumn/Winter show. Before we went to watch the show we collected our blogger passes. There is a section before the show area where we were given free jars of lemon juice (which were so tasty!) and Kripsy Kreme doughnuts. 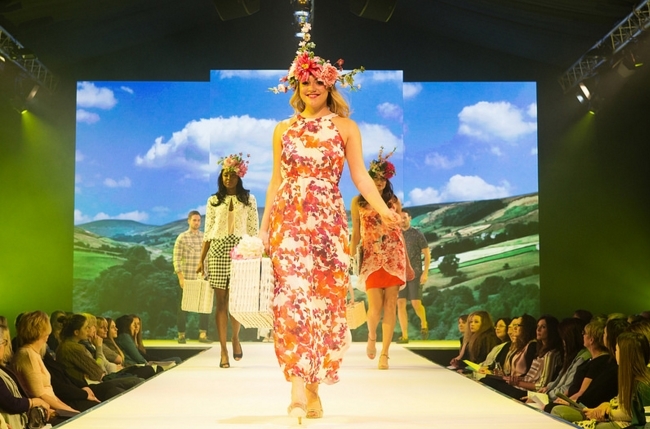 The show was presented by Denise Van Outen and Mark Heyes this year, with Denise wearing a bright pink dress from River Island. 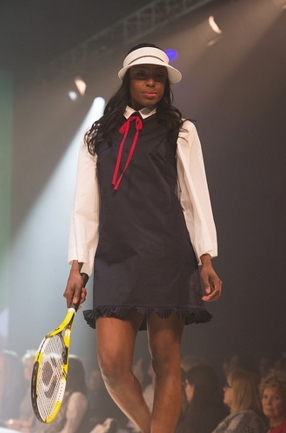 The models' make up was created by Boots No7 whilst hair was styled by Tomlinson Hairdressing. Fashion: Marks & Spencer, Sunglasses: Specsavers. The first scene was based on Wimbledon. There were plenty of black and white and interestingly headbands with tennis balls on! Not exactly your day to day fashion but a good contextual detail for the runway. 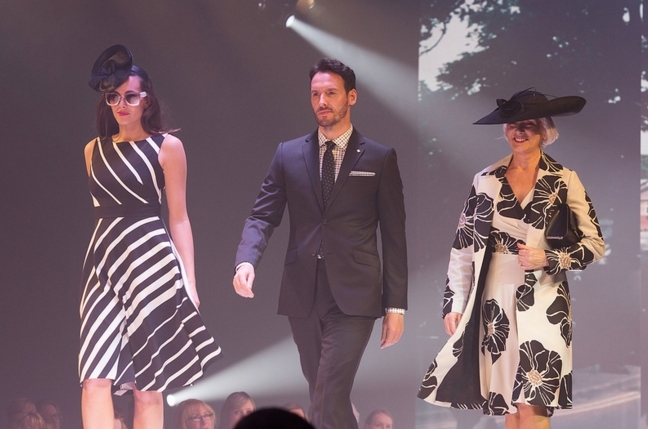 Fashion: Hobbs, Menswear: Moss Bros, Children's Fashion: Marks & Spencer, Accessories: Accessorize. This was a picnic theme. Floral, floaty dresses aplenty with pink and white flowers. The backgrounds of the dresses varied from black to paler backgrounds. 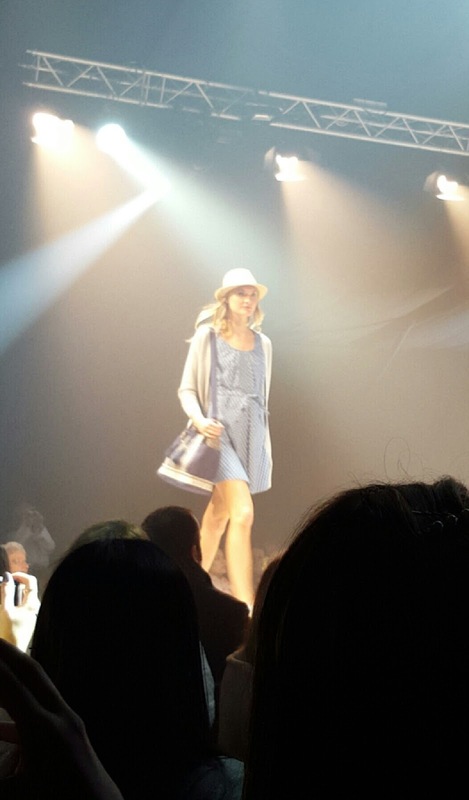 Light blue denim dresses with a tie-belt to bring it in at the waist. Blue denim bags and beach bags, bringing the denim to the beach. Would have never thought of denim beach bags! Fashion: John Lewis, Sunglasses: Sunglass Hut. Royal Ascot themed, stripes and flowers appear again. Interestingly there were horizontal and diagonal stripes which I have not seen before in fashion. These stripes were found on dresses, skirts and blazers. There were big hats like you would expect in the races and heels with thin straps going all away across. Overall plenty of monochrome. Fashions: Jack Wills, Children's Fashion: Marks & Spencer, Jewellery: Pandora, Accessories: Accessorize. Wedding theme so to be expected there was a lot of white. There were see-through white flower-lace dresses and white shirts for the men. White, thick flower chokers were also worn which I thought was much more light and innocent way of wearing chokers than how you normally see them. Fashion: Coast, Hair: Tomlinson Hairdressing, Make Up: Bobbi Brown. Every time they have a competition to find normal people to receive a complete makeover and to walk the catwalk. Tonight's lady wore a beautiful silver clutch bag where there was a handle that crossed over the hand in the shape of a bow. I hadn't seen something like that before and thought it was a stunning detail for a clutch bag! She also wore a two-piece where the crop top was silver and incredibly glitzy with a long, pale green and white skirt. She looked gorgeous! This was Henry Royal Regatta themed. 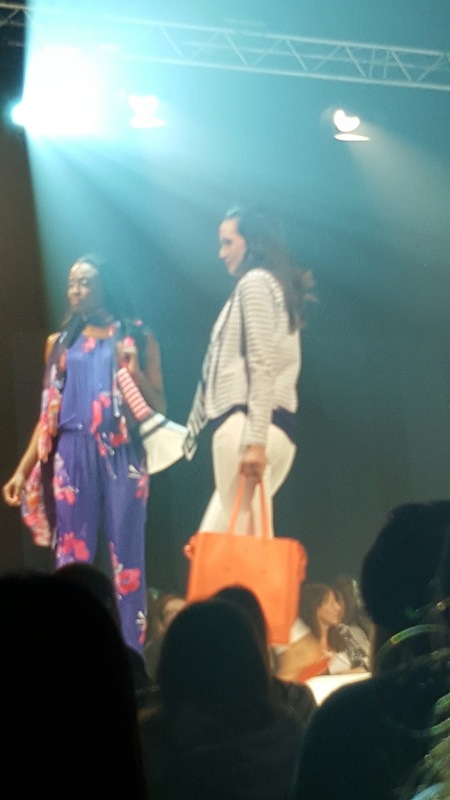 I spotted a vibrant orange structured bag which I particularly liked and there were red and blue striped beach bags. Another outfit that really caught my eye was a royal blue jumpsuit with dark pink flowers. Such a statement outfit! Fashion: Warehouse, Menswear: New Look, Footwear: Soletrader. There were black and white checks which I am personally quite the fan of! A holographic bag caught my eye so I am eager to go find it! Again there was more denim which was fashioned in the style of a cardigan; seemingly a more relaxed way of wearing denim. 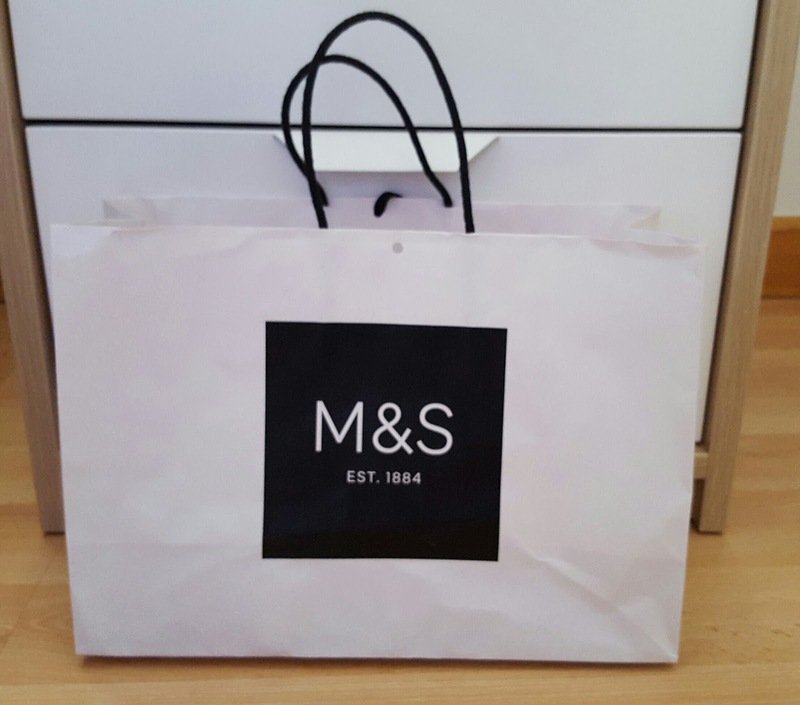 Fashion: Marks & Spencer, Accessories: Accessorize. 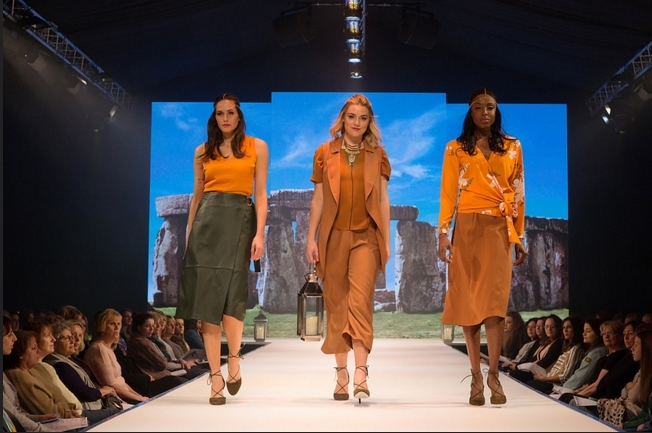 So much terracotta colours with camel and orange. These shades screamed sand to me and seemed great for a trip to the beach. White flowers also made an appearance. This scene was close to home as it was Bristol Balloon Fiesta themed. 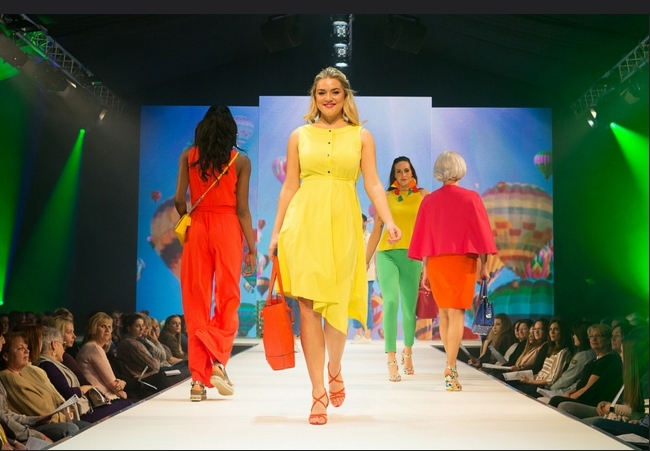 Inspired by the hot air balloons the colours were certainly bright and bold. No patterns, just block colours. Definite statement colours such as red, green and yellow. Also spotted a cape jacket which seems like something loose for covering for your shoulders which would seem good for the summer when you want to cover your shoulders. My favourite name for a scene! As the name suggests, there were short, tight dresses which were in the lovely colour of pastel blue. There was also a floral two piece crop and long skirt which were again tight fitting. Seemed lovely for nights out. The men were wearing the standard baseball shirts. In conclusion, what's on trend for Spring/Summer this year is clear: stripes and floral. However, the stripes are changing up a bit this year as the stripes are going diagonal! I have never seen that before but Mark did inform us that companies have stayed clear of that pattern before due to it being more expensive to make. Light blue wash denim also seems to be a prominent feature whether in the form of jackets, dresses or bags. My favourite was definitely the royal blue jumpsuit with the flowers as it was so beautiful looking and stood out amongst anything anyone else was wearing! A lot of the bags were catching my eye as well and I feel now that I really want to go and buy a new beach bag for my travels. I was also interested in how they had made white flower chokers. I love chokers but when I think of chokers I think of black plastic chokers or velvet ones which seem more dark and edgy. Despite loving that look I was pleasantly surprised at how they could make chokers more for people who don't like that daring look and can make them look so light. What are your favourite pieces to wear in Spring/Summer? 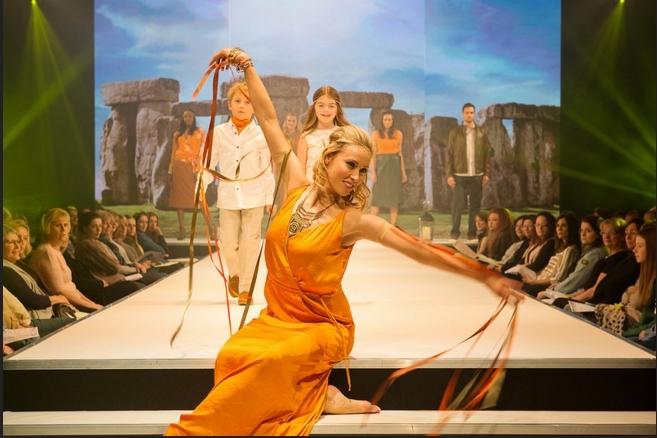 PS- Credit for the photos go to Charlotte Stone, Gina Jones and The Mall Cribbs Causeway. Photos 2, 3, 6 and 13 (basically the crap quality photos!) are my own. 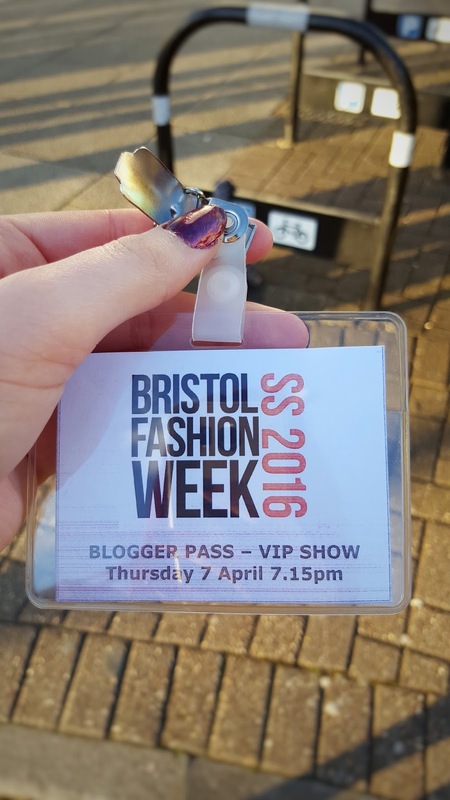 Last Thursday, Emily and I went to a Marks & Spencer blogger event which was on after the Bristol Fashion Week show (post coming soon!). On arrival we were greeted by the team who gave us the run down on what we could do. We were given food and drink of theirs to try out too where I chose a pina colada juice and a little chocolate cake which was very nice! They had plenty of different flavoured crisps to try and other cakes. It seems Marks & Spencer do a lot of snacks in which I haven't even heard of before! After looking at the food and drink on a little summer display, we looked at the make up they had on display. 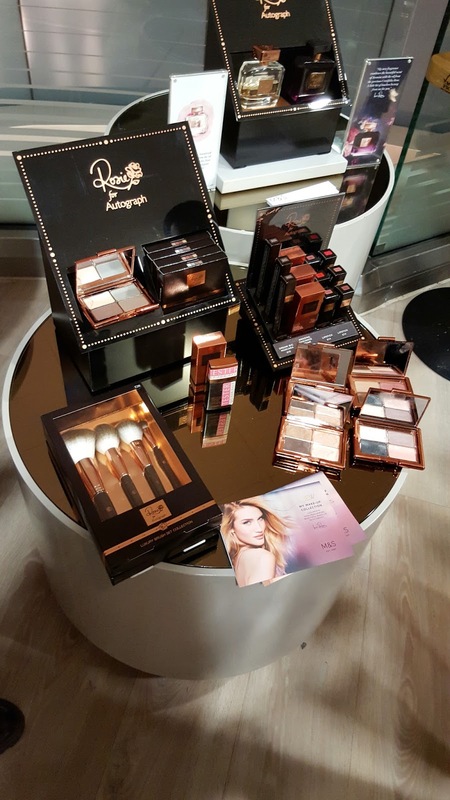 They had a display of the new Rosie for Autograph make up range which I had been hoping to see at the event because I have seen so many bloggers talking about it. Can we just talk about the packaging?! The rose gold makes it look so luxurious and more expensive than it actually is! My favourite was the collection of make up brushes. 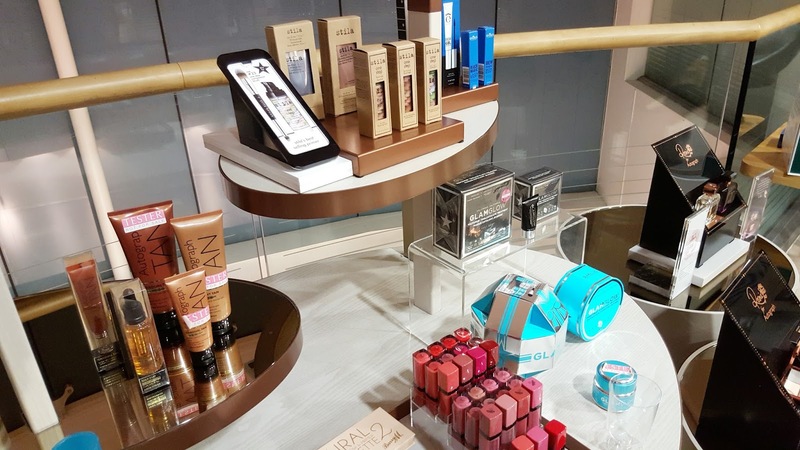 There were also other plenty of beauty brands on display including Autograph fake tan, Eyeko, Stila, BarryM, the famous Bourjois liquid lipsticks and a GlamGlow mud face mask. Some of these products I had only ever seen online before so it was fun finally seeing them in the flesh! One of the members of staff tried the GlamGlow masks on the back of our hands which smelled like green tea and were supposed to make your skin glow. It felt nice and made me wish I could afford to buy GlamGlow products! Another option was to get a mini manicure done which I thought was so cute! I was a bit annoyed with myself because I had quickly painted my nails before leaving for the event and had I known they were doing mini manicures I would have gotten one done there! They seemed to have lots of vibrant Summer colours to choose from. 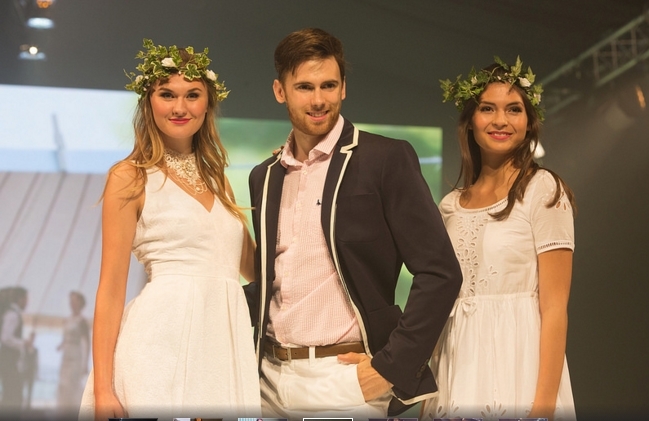 The last part of the event was to look at clothes they were bringing out for their Summer style. There were these pale blue and white striped pyjamas I really liked and they had lots of floral and white. They set them up on display really nicely by hanging them at the top of their fitting room doors. 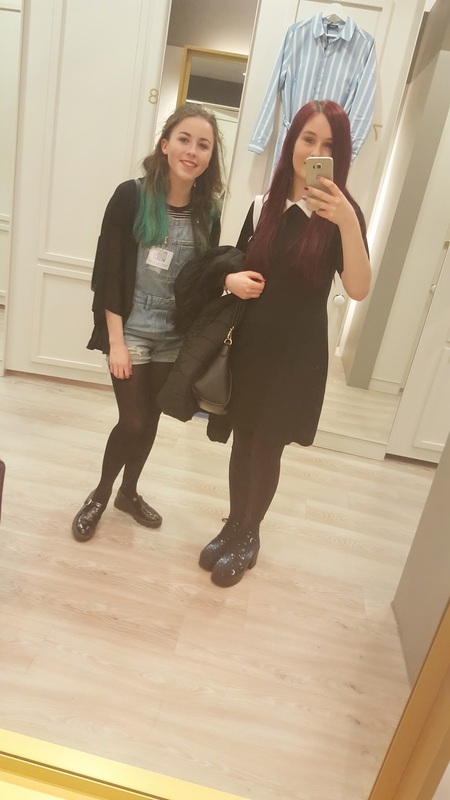 Their fitting rooms are quite aesthetic so it certainly helped sell their fashion. The event was lovely and the staff were welcoming. They were all very nice and they spoke to us all and had a chat. At the end they even gave us goody bags which was generous of them! 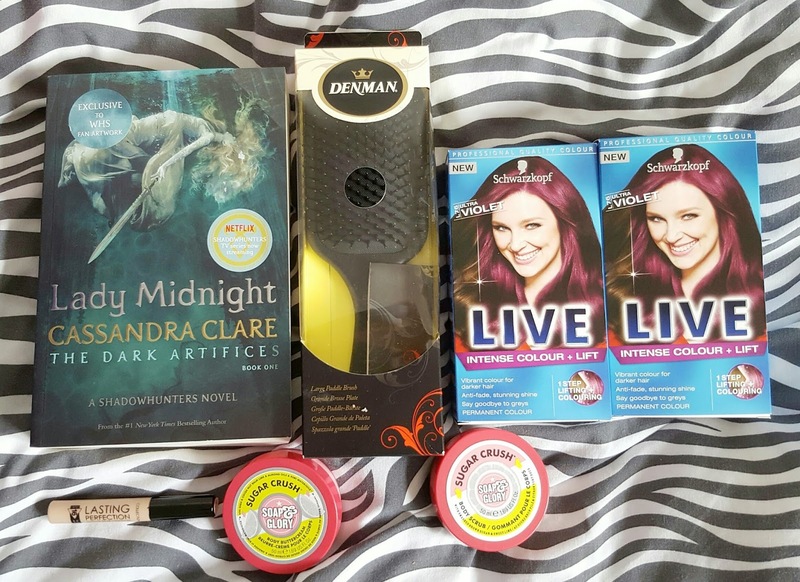 The goody bags included all brands I had never tried before so I am looking forward to using them. 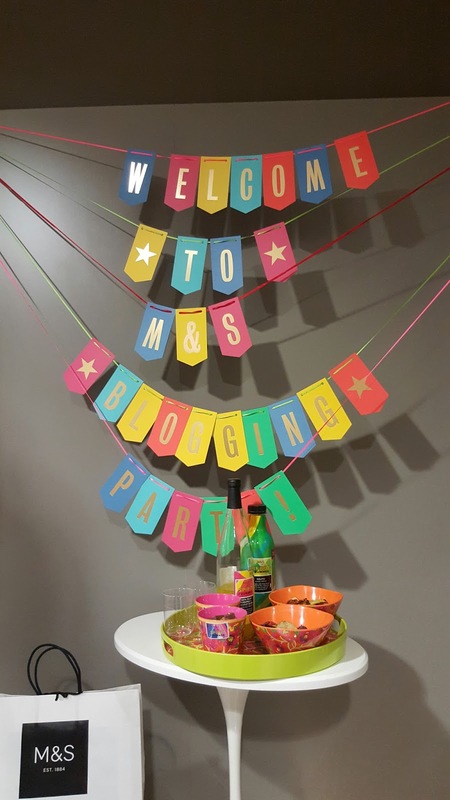 Admittedly I never used to go in Marks & Spencer much before but now I feel more inclined to go in there more as they were friendly and had lots of things that I liked. Fake Bake Amplify Daily Gradual Tan, Rosie for Autograph Amazing Radiance Cream, Dr. Hauschka Facial Toner, Dr. Hauschka Revitalising Day Cream, Autograph Eyeshadow Palette, Living Proof Nourishing Styling Cream, Nuxe Detoxifying an Youth Revealing Anti-Aging Care, Nuxe Multi-Purpose Dry Oil Face, Body & Hair and Nuxe Body 24hr Moisturising Body Lotion. 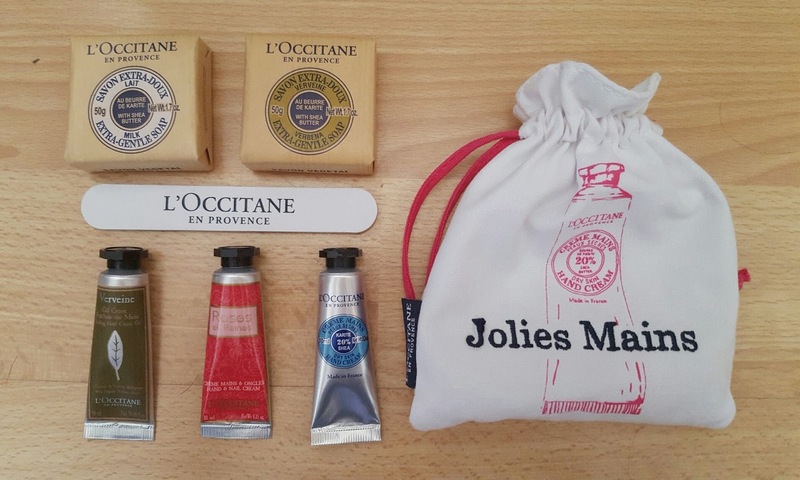 L'Occitane: Dry Skin Hand Cream, Cooling Hand Cream Gel, Roses Hand and Nail Cream and 2 Hand Soaps. 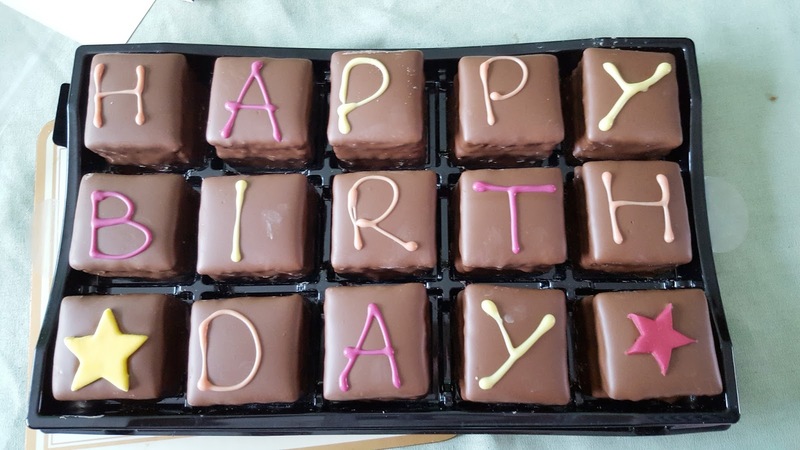 On the 3rd of April it was my 19th birthday. The day before I had a meal with my friends at Las Iguanas and went out down town with my boyfriend. Then on Sunday I went for a meal with my family and boyfriend (at the same place!) and we all hung out in the garden afterwards playing with my niece. For my birthday I mainly asked for money, however I did get a few presents! Lush The Experimenter Bath Bomb- My friend Emily bought me this which I'm excited to use as I did have one before but it turned out to be a faulty one! Kiko Milano Water Eyeshadow 229- Another one from Emily. She just knows me too well! This is a beautiful high-shine, glittery silver which can be used dry or wet. Will definitely have to review this. Paddle Hairbrush- I forgot to note down the brand of this paddle brush before I took it out of the packaging but I asked for a paddle hairbrush as mine has gone manky! This is from my Mum and I find them best for keeping my hair straight. Diesel Loverdose- My boyfriend bought me this. I hadn't asked for it but damn that boy knows me. He knows I like perfumes that look alternative like this and it's beautiful. I can't wait to try it! Essential Amethyst Tear Drop Necklace- My boyfriend also got me this necklace and I love it. It's a beautiful tear drop amethyst which are purple and has a kind of vine-type swirl going over it. Lady Midnight by Cassandra Clare- My fellow book lover Ruby got me this one! I didn't know Cassandra Clare had brought out another book but now I am pleasantly surprised. It is a big book which I love and the cover is quite artistic. I'm a fan of Cassandra Clare's books so I'm sure I will enjoy this. Denman Large Paddle Brush- My sister Kelly got me this. I don't think Mum and Kelly knew they were both getting me one! Not a problem though, as it means I have a spare brush when the first one goes a bit yucky. 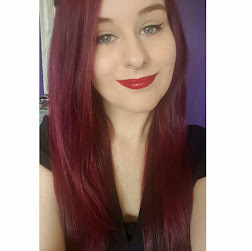 Schwarzkopf XXL Live 'Ultra Violet' Hair Dye- My sister Lisa bought me these because this is the hair dye I have been using for years. I'm trying to save money at the moment so this is helpful as it saves me buying my next batch of hair dye. Collection Lasting Perfection Concealer- Lisa also got me this as again, she knows I use it religiously and it saves me from having to buy my next concealer. Very helpful! Soap & Glory Sugar Crush Body Scrub and Buttercream- Kelly bought me these and I love Soap & Glory so I was grateful. Every birthday and Christmas I'm always on the look out for body scrubs, creams and gels to save me from having to buy them through the year. The sugar crush smell is incredible too! National Book Tokens Gift Card- I received this from my Mum's ex-boyfriend. Even though he is her ex he was in our lives long enough to still keep in contact with my siblings and I. Anyway, he thought I could use this to buy some books or to help with anything I need for University. Disney Cheshire Cat Cushion- My friend Antonia bought me this. I have an undying love for Alice's Adventures in Wonderland. I love the films, the books, the video games, merch..the list goes on. I even want a Cheshire Cat tattoo. But anyway, she bought me this cushion and I love it. It goes well on my bed with my Pikachu! 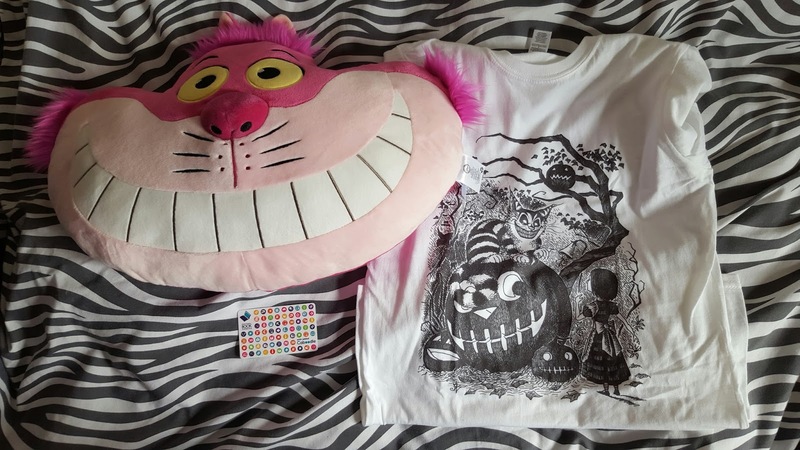 Cheshire Cat T-Shirt- Another gift from Antonia, a t-shirt with the Cheshire Cat on. I will never get over the artwork. 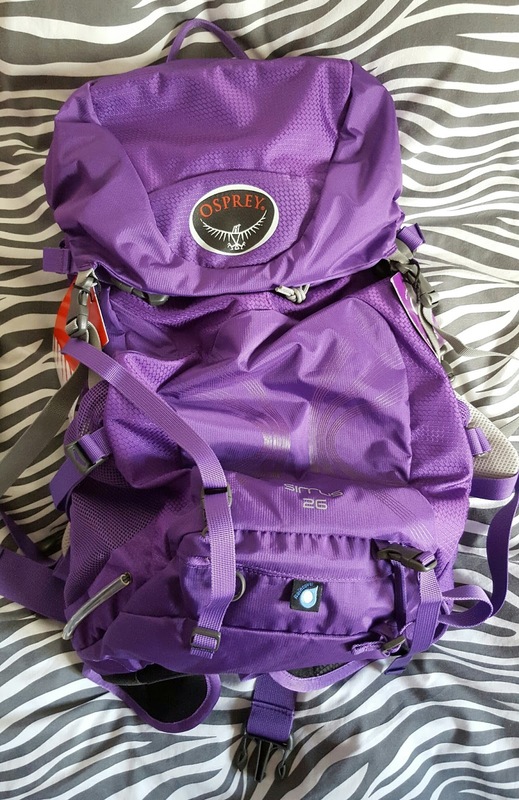 Osprey Sirrus 26 Purple Backpack- My sister Kimberley and brother Jamie bought me this for when I plan to go interrailing around Europe with Antonia. I'm super thankful for this as I hadn't thought much about how I was going to carry everything and it seems super versatile. Nice colour too! I'm very thankful to everyone for what they got me and I had a nice birthday. 19 seems like a weird age to me as 18 is big, 20 is out of the teen years but 19 is just a random age in between. Do not feel like I'm going to be 20 next year! 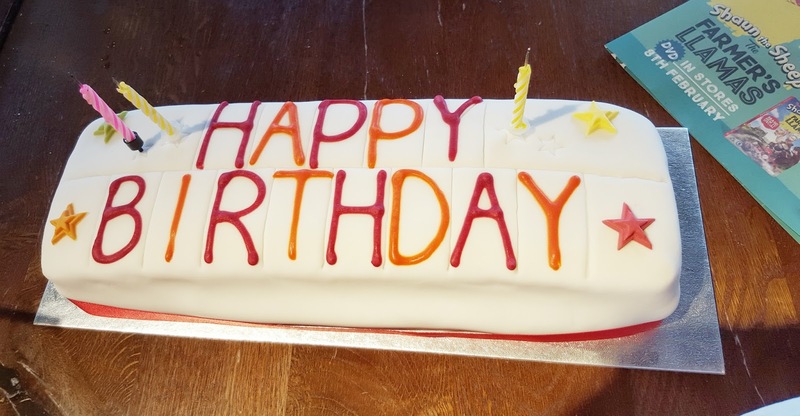 To see what I got for my 18th birthday you can click here. 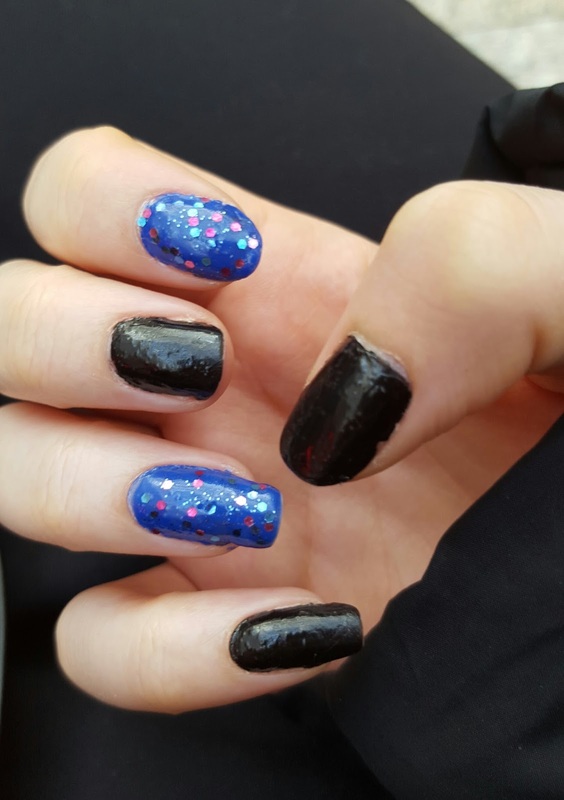 The application of nail polish in the photo above certainly isn't my finest of nail polish applications, but nevertheless I wanted to share what I had on my nails at the moment! Since seeing what it is like to have your nails done professionally I have been trying hard to resist constantly getting nails done and instead trying to use what I have in my own kinda big collection. I really like black and I really like blue, so why not mix them together? I haven't actually worn black nail polish that wasn't gel in years! Here you can see I have used Collection Work The Colour 'Sonic Blue' on my index finger and ring finger. How can I resist a nail polish that is a reminder of Sonic the Hedgehog? As for the black I have used Rimmel 60 Seconds 'Black Out'. It applies quite opaque for a black polish and doesn't take long to dry which is a relief. After my nails dried I used Rimmel Glitter Bomb Top Coat 'Bedazzle' which are medium sized glitter pieces in colours of red, blue and pink. Admittedly they haven't been lasting on my nails long and chipping everyday, but overall I like how they look and don't mind having to fill in the chips.